Drywall is the term used for a common method of constructing interior walls and ceilings using panels made of gypsum plaster pressed between two thick sheets of paper, then kiln dried. Some panels are made with fiberglass instead of paper to prevent mold growth. Drywall construction is used globally for the finish construction of interior walls and ceilings. Drywall construction became prevalent as a speedier alternative to using plaster based interior finish techniques, which involved forcefully spreading a substrate of coarse plaster, known as the base (made up of the scratch coat and (optional) brown coat), onto the wall's lath-work before finally applying the smoother finish coat, each layer added in succession and all by hand. Drywall, by contrast to plaster, requires hand finishing only at the fasteners and joints. The drywall process requires less labor and drying time, lending its name to the panels used in the assembly. Panels are also known as gypsum board, wallboard, plasterboard. 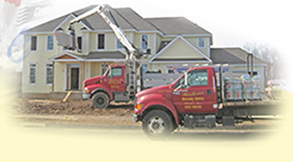 Westover Building Supply provides sheet rock, drywall, gypsum products and all building needs to Western MA, The Berkshires, Northern and Central CT, Southern VT and Southern NH towns including: Springfield MA, Chicopee MA, East Longmeadow MA, Holyoke MA, Longmeadow MA, Ludlow MA, Monson MA, Northampton MA, Greenfield MA, Pittsfield MA, Lee MA, North Adams MA, Palmer MA, Agawam MA, South Hadley MA, Westfield MA, West Springfield MA, Wilbraham MA, Worcester MA, Hartford CT, Enfield CT, Keene NH and Brattleboro VT.